So then: Vista is here. And was it worth all the fuss, hype, hopes and the fears? Well, yes and no. It's easy on the eye. The Aero Glass thing is sweet. But there's been a lot of gabber about how many of your resources it uses, and that can't be a good thing, can it? Here's the deal: with today's technology, it just doesn't matter. This rig from system-builders Advancetec comes pre-installed with Vista, and its gaming abilities simply aren't in question. Knocking through Company of Heroes in 1680 x 1050 at top settings, you'll see an awesome return of 86fps. Not to be sniffed at, that. Likewise, Oblivion breezes by at ultra settings with HDR at 46fps. Admittedly, this beast is touting the mighty GeForce 8800GTX, Nvidia's high-end DX10-ready offering, so frankly, you'd expect it to perform pretty well. But with these demanding games as benchmarks, we're confident it'll run everything else around at the moment at a glorious framerate. And let's not forget, DX10's on the way... this PC will be ready to rock, straight from the box, with the likes of Bioshock and Alan Wake. In fact, it's well appointed in all areas. At its heart lies the 2.4GHz Core 2 Duo and 2GB of Corsair DDR800 in dual-channel mode. It's all mounted in the Asus P5N-E SLI mobo, and wrapped up in the NZXT Lexa chassis. Long-time readers will recognise that this one of our fave cases of all time, and with good reason - it's a well-designed chassis, with a clean quick-release system for all your bits. 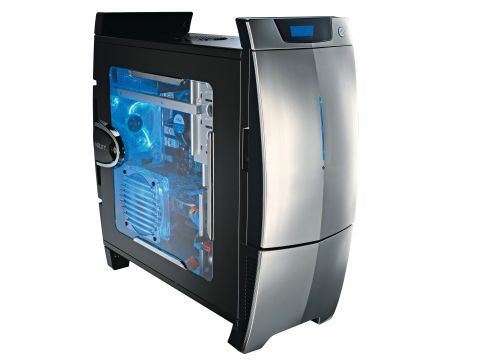 Plus, it comes with a host of blue LED fans, so it looks the part, and there's enough space for modding if you fancy it. What's more, the price is right. Above and beyond the cost of the parts, Advancetec charges very little for building the rig, and it's a clean job - all the cables are tied away for a nice view through the window.